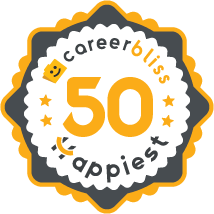 The 9th annual CareerBliss Happiest Companies in America recognizes the top companies from around the nation that are building positive teams, managers and an overall happy work culture. What’s truly unique about the CareerBliss Happiest Companies? We don’t solicit reviews and companies do not pay to be a part of the process. This system creates an unbiased and authentic process that allows people to share what truly drives happiness at work. Employees review more than 200,000 companies and only 50 make it. Make sure to check out each company’s BlissScore which includes factors such as company culture, leadership, overall work atmosphere, one’s relationship with coworkers and CEO ranking. Did your company make the list? If not, submit a review and tell us why. Looking for a happier job in 2019?